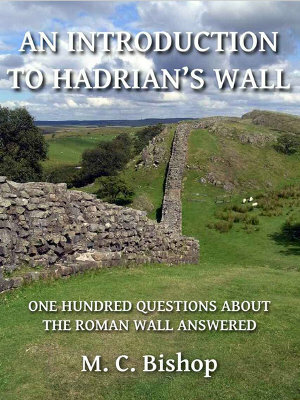 This is not intended as an introduction to the centurionate or legionary organisation in general, but rather as a convenient aide-memoire to sort out who was doing what to whom and with what when it came to building Hadrian’s Wall. Nevertheless, a little background detail needs to be sketched in, hopefully with the lightest of touches. 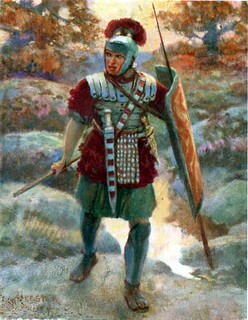 Everybody knows a legionary centurion (centurio) commanded a century (centuria) of 80 men, don’t they? That is certainly their basic function, but we also find them commanding entire auxiliary units or even detachments of units (vexillationes). Centurions were very versatile and they included within their ranks a wide range of experience. 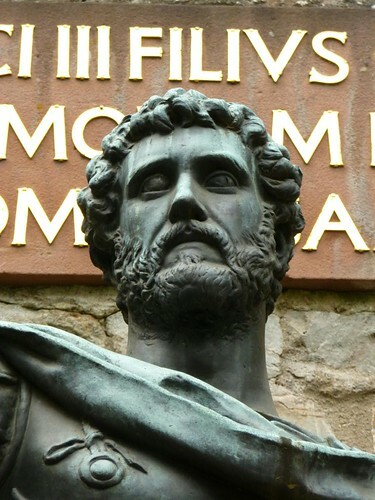 The Late Roman epitomist, Flavius Vegetius Renatus (known to all who love and loathe him as just Vegetius), author (perhaps ‘compiler’ is better¹) of the De Re Militari (also known as the Epitoma Rei Militaris), had something to say about legionary structure. He tells (DRM 2.6) how a legion lined up its cohorts in two rows on the battlefield, with cohors I on the front at the right (the position of greatest honour) and so on to cohors X in the second row on the left (you get the picture, I’m sure, but just in case, I’ve drawn you a diagram; just in case you think ‘but cohors I is on the left!’, think of it from the Roman point of view). He also said that the better recruits went to the right, centre, and left cohorts of both lines (I, III, V, VI, VIII, and X) because of their important positions on the battlefield and I’ve picked those out with a darker shade. All of this, he asserted, was reflected in the rank structure of the centurions, so that the senior centurion of cohors I was at the top – and the junior centurion of cohors X at the bottom – of the pile. Much academic ink has been spilled debating the merits and demerits of this supposed hierarchy and no firm conclusion reached. Suffice it to say: there was a structure of sorts. No examples have been found in Britain yet but that is no guarantee that they were not used here too. whilst others imply it (> P P was the abbreviation for centuria primi pili and the only primus pilus in a legion was in cohors I). 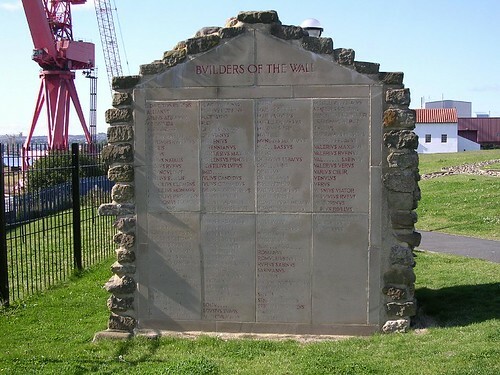 Some stones record distances constructed and 30ft occurs on three stones from Wall Mile 49 (1917, 3416, 3426). As is pointed out by the editors of RIB III, centurions carried a ten-foot measuring pole, the decempeda, so 30ft is an obvious natural multiple of that convenient standard. Centurial stones are rather informal affairs (seldom mentioning the actual legion involved), and completely different to the massive distance slabs on the later Antonine Wall. Primarily recorded in the stretch either side of Housesteads. Primarily recorded in the stretch west of the River Irthing. Primarily recorded in the stretch east of the River Irthing and between Chesters and Carrawburgh. Many centurial inscriptions – probably most – do not cite a parent cohort, so can only really offer confirmation for those that do and are excluded here. Centuries lacking their centurions are indicated within square braces ; RIB numbers are in brackets (). Stephens’ study of the centurial inscriptions was an elegant piece of epigraphic detective work that enabled him to work out that the Second and Twentieth legions built the curtain wall between Wallsend and the Irthing (with the Sixth building most of the forts), and the Second and Sixth between the Irthing and Bowness. The implication of his conclusions seems to be that the Sixth were either not there for the fun and games to begin, but arrived in time for the ‘forts decision’, or that they built the Turf Wall to the west whilst the other two were preoccupied with the eastern stone section. The Sixth may even have had a little help from their friends, the Classis Britannica (1340), who had brought them across the Ocean (1320) with the help of Neptune (1319), and went on to build Benwell fort (1340). However, it should be pointed out that Breeze and Dobson differed in their opinion of which legions did what. Our knowledge of the various centurions is clearly largely dependent upon the excavation and consolidation of the Wall undertaken so far and it currently favours the Twentieth over the Second Legion, but that may change over time. The list above shows centurions from every cohort of the Twentieth Legion except Cohort VII, which may imply that it was left back at the legion’s base at Chester. Other cohorts (III, V) had up to five centurions present, whilst Cohort VI had all six centuries, although two of them were without centurions (so presumably commanded by the deputy or optio). The First Cohort has seven named centurions recorded, so presumably there had been some transfer and/or promotion whilst the unit was working on the Wall. Some centurions resolutely refused to provide a cohort number and these presumably filled in some of the gaps. If the complications of my picture in 1947 ‘amazed’ a reader, I know not what verb would be appropriate for this Second Edition. ¹ Vegetius is all too reminiscent of a school child using Wikipedia to do his homework, although he has a range of sources at his disposal, of varying quality, but he has nevertheless disengaged his critical faculties. He seems to quote whole chunks verbatim and then has a habit of inserting a banal comment of his own, as if to show he has actually been paying attention. What if Amazon can’t even get your own book for you? 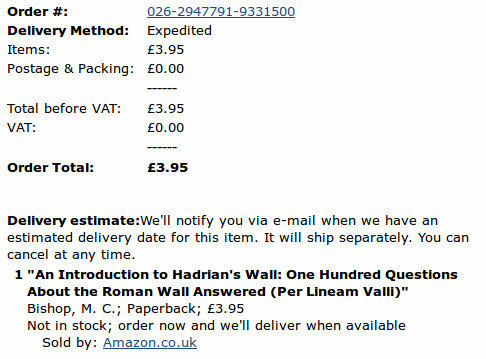 As an experiment, I produced a few paper copies of my ebook Introduction to Hadrian’s Wall, partly to see if it would sell at the inevitably higher price dead trees demand, and partly to satisfy the book fetishists who see ebooks as everything from harbingers of the end of the world to simply aesthetically displeasing. Making books is what I do. Every aspect of it, so this was not a particularly onerous or demanding task for me. Distribution, however, is a whole different pramful of rancid dumplings. Very small publishers always need a slack handful of dodges, wheezes, and general trickery to make sure they can obtain a modicum of visibility amidst the loud, vulgar shout that is the corporate publicity of the big boys. I made sure some copies went to Oxbow Books, not least as they could sell it directly online and through their catalogue, but also because I knew they put their stock out through Amazon. If you see a note on Amazon that something might take a few extra days to arrive, it’s probably because they don’t have it in stock but one of their suppliers does. Therefore, in order to test the system, I decided to order my own book. You knew I would, didn’t you? Call it ground-truthing my supply chain, if you like (if you’re wise, you won’t like, but we live in an age of pointless jargon so who am I to deny a little more a brief-yet-evocative existence?). I had a couple of spare books sitting on the shelf in front of me, mere centimetres from the tip of my nose, so I was relatively confident that a) the book existed and b) it could be obtained. Here, gentle reader, is the point at which the merchandising behemoth that is Amazon started to falter. I began to receive periodic emails saying they were having difficulty obtaining the book, the delivery date slipping ever further away. I didn’t give up hope; I tried emailing them back and explaining the situation. Their response suggested they either didn’t read what I said very carefully, or they just used a form response. Still I didn’t give up hope; I kept waiting, more negative emails came. Until finally I got an email peremptorily cancelling my order (them cancelling it, note, not me). I particularly liked the bit that wouldn’t let me reply to this. At this point, I gave up hope. Amazon themselves had admitted defeat in what for them was clearly an open-and-shut case. So if you think Amazon is the way of the future, I would suggest you think again. It may well be that the cracks are starting to show. They were a game-changer; now I suspect the game itself may well be changing. My next test? See if an independent bookseller can get it for me. Upon asking for a bed? I was directed to a third; saw only the landlady, a fine figure, well dressed, had been a beauty, and yet shewed as much of that valuable commodity as could be expected from forty-five. “It has been a public-house; and the sign was forgot to be taken down.” — I retreated. We met a short time after, when a slight civility passed between us. A week elapsed, when, dining at a public table in Carlisle, I mentioned this singular adventure. The whole company, in a moment, recognized the person I alluded to, and told me, “She had long been connected with the Duke of ––; had issue by him of some standing, who were training for genteel life, whom he allowed her to visit once a year. That whenever he came into those parts, he chose to see her, and that she bore an amiable character.” I therefore think she acted perfectly right in refusing admittance. I afterwards procured a bed, fell a prey to the dancing gentry of the night, and the next morning, turned and shook my shirt, being unwilling to carry off any thing but my own. The place where this Station was, is easily found; but no marks remain, not even that roughness in the ground which distinguishes every other. Agricola and Hadrian totally disappear; and all that can be seen of Severus is his ditch, which is nearly obliterated, about two hundred yards long, part of which is a bye lane, and part by the hedge, in the inclosure, fourteen yards wide, and four feet deep: both point to the Station, and down the precipice, fifty feet high, to the river. I observed a stone in the street, converted into a horse-block, three steps high, with the figure of a man, in a recess, eighteen inches in height, in a Roman dress, and in great preservation. I wonder the boys had not pelted him out of the world. I inquired its history of some elderly people; but all I could learn was, “It stood there before my time.” I believe it to be a Roman Chief. The Wall then proceeds from this elevated Station down the precipice, where it crosses the river Eden, to Carlisle; and makes a remarkable bend to the right, evidently to cross at the narrowest part, and to include the city, which was a place of consequence in the time of the Britons. There are but two places of magnitude in the whole line of the Wall, Newcastle, and Carlisle, and it makes a turn to grasp in both. Stanwix is but about four hundred yards East of this city; and that space consists of meadow and water; perhaps, in a flood, all water. The Wall points very near the North foot of the Castle-hill, keeping the Eden on the right, all the way to the sea. While in the desolate, the rocky, the mountainous regions, I enjoyed the pleasing curiosities of the Wall, the banks; the Stations, &c.; but, now I am travelling in the beautiful and cultivated parts, I am travelling without my friends. I search, but cannot find them. Camden, and Warburton, “thought the river formerly ran near the Castle, at Carlisle, and had changed its course since the time of the Romans;” but give no reason. From a survey of the ground, I think it has not. At Kirkanders, I saw a precipice, along which the Wall had run, and where it did not need a trench. One hundred yards within the Wall, I saw, running through a corn-field, the faint remains of Agricola, and Hadrian’s works. Some little may also be seen near Wormanby, and at Beaumont. This is a podcast about the Romani Walk undertaken by Ben Kane, Anthony Riches, and Russell Whitfield in aid of the charities Combat Stress and Médecins Sans Frontières. For details of the amount raised go to the Charity Giving web page for the walk. An account of the walk was produced by PLV for Storify, whilst Ben gave some insight into his motives and training in a blog post for Waterstones. More photos of the Romani Walk can be seen on Flickr. The podcast is available as an MP3 file (for traditionalists: 85Mb) and Ogg Vorbis file (for freedom loving hippy types like me: 99Mb). Right click either of these to download them. A bit torrent link is also available. Great Chesters has not enjoyed the same degree of recent excavation or consolidation as other sites on the former Clayton estate so the epigraphic assemblage is correspondingly smaller. Nevertheless, there are some interesting altars and some striking dedications and tombstones. Great Chesters is quite small and so is the haul of inscriptions, although it is not without interest. Jupiter and his Eastern counterpart, Jupiter Dolichenus, are present amongst the altars and the Veteres naturally put in an appearance (1728-30). Fortuna also pops up (1724). More legionary centurions are included (1725, 1733, 1738, and 1746) or hinted at (1724) and a rara avis (comparatively speaking), a cornicularius (1742) – the head of the commanding officer’s office staff – puts in an appearance. A granary was restored by the Second Ala of Asturians in 225 (1738), once offering the innocent explanation ‘collapsed through age’ that has, in the past, tempted scholars to see this as a euphemism for damage by enemy action (although that view no longer prevails). Finally, the dedication to Hadrian found near the east gate is tantalising, since only half the die was utilised for the inscription; did the letter cutter badly misjudge the available space (which seems unlikely), or had he intended to add something else in the top half? We shall probably never know. 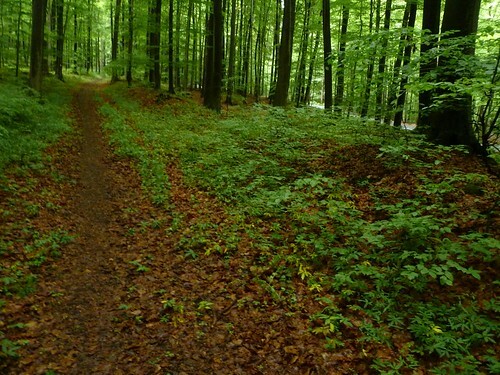 Some people derive pleasure from walking long-distance paths. I am not one of them. For me, walking is slow, tedious, and often painful. A cyclist since the age of seven, I get frustrated that it takes me a whole day to walk what I can cycle in an hour. Cycling also takes little toll on my feet and knees (bane of many an archaeologist’s life), unlike walking – in my case at least. Nevertheless, I reluctantly have to admit that walking is the best way to see Hadrian’s Wall and appreciate its use of the landscape; cycle paths just don’t cut it. I have been walking the Hadrian’s Wall Path National Trail (this year celebrating its tenth anniversary) regularly since 2005. It was therefore interesting to get the opportunity to explore part of the Limesweg along the Obergermanisch-Raetischer Limes (ORL) between the Rhine and the Danube (crossing the Roman provinces of Upper Germany and Raetia, hence the name). The whole frontier is around 340 miles (550km) long and I was undertaking the first 100 miles of it, from Rheinbrohl to Kastell Saalburg. The first difference was that considerably more than half of the Limesweg was within woodland. 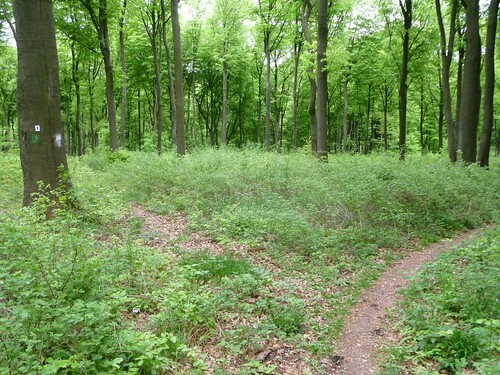 German forests tend to be much more varied than the softwood monoculture of the UK’s Forestry Commission, so the range of flora and fauna encountered is much greater. However, what starts out as fascinating can eventually become tedious and disorientating. Second there was signage. In terms of waymarking, Hadrian’s Wall wins hands down, with the little acorn logo predictably regular in both directions (the west-to-east route used to be less well provided; no more). The Limesweg, with its ingenious arrow in the form of a watchtower, ranged from over-provision (a sign nailed onto every other tree) to downright inadequacy (none for nearly a mile: eek! 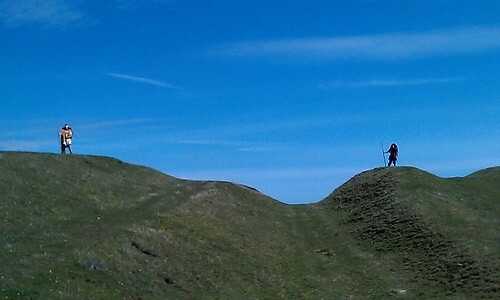 ), sometimes leaving this walker retracing his steps to attempt to find the hidden marker he had missed. 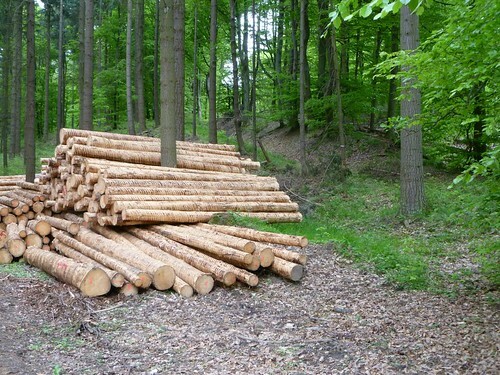 The woodland aspect has a role to play here, with logging activities (mostly draw felling, interestingly; I only saw clear felling twice in the whole 100 miles) often removing trees that bore the tell-tale arrows. 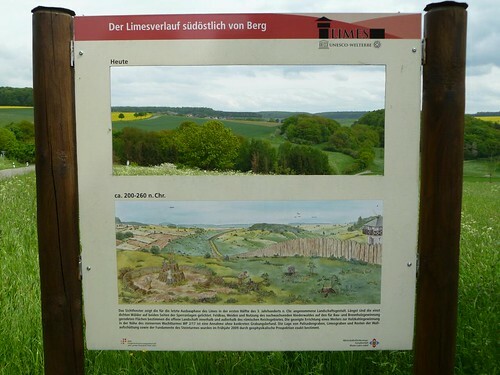 Information boards were far more common than on Hadrian’s Wall, however, where only consolidated monuments get them; in Germany, even the mound where a tower used to be gets a full, bilingual explanation. Actually that’s only partly true, for the signage was not consistent. 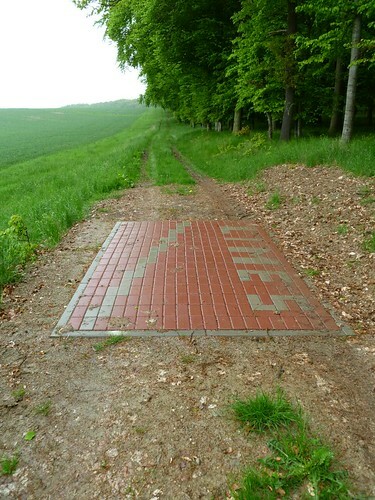 Crossing over the state boundary between Rheinland-Pfalz and Hessen (just to the east of Kastell Holzhausen) produced a noticeable drop in the amount of useful information offered to the walker. Hadrian’s Wall manages to maintain a more consistent standard of presentation across Tyne & Wear, Northumberland, and Cumbria (perhaps aided by the fact that English Heritage, charged with the overall care of the Wall, is a national organisation). The terrain is different too. Regardless of which end you start Hadrian’s Wall (west remains best in my opinion, but you knew that). There is a gradual ascent from 0m OD at either end to 345m OD on Winshield Crags. On the Limesweg you can match that in a single day. On my third day of walking, for example, between Sayn and Kleinkastell Hillscheid, my altitude ranged from 84m to 428m (SRTM) over just 10.8 miles! There was a familiar rhythm to climbing steeply out of a river valley, going along for a bit, then an equally steep descent into another valley. Sometimes the ascents and descents were gentle, but usually not. Almost invariably they were tree-clad. Another difference was that nobody seemed to walk the whole thing. I met only a couple of walkers intent on long-distance travel. 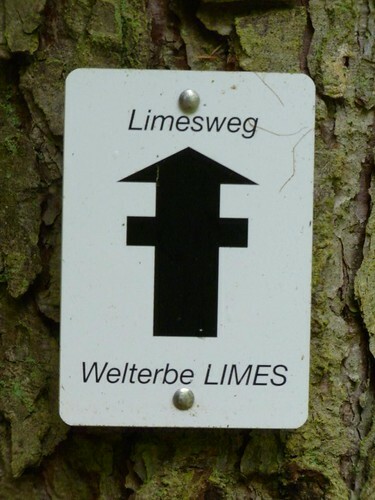 The Limesweg mostly serves Germans at weekends, when they go out to enjoy the countryside seriously for the day, often walking a section of the path. When I admitted to my aim to walk from Rheinbrohl to Saalburg, it caused a few raised eyebrows. That being said, many long-distance walkers plod along the Hadrian’s Wall path relentlessly ignoring the signage, intent on getting stamps in their passports (no, I don’t understand that obsession either). There was little by the way of footpath maintenance on the Limesweg. On Hadrian’s Wall, an active programme of plastic mat (or paving slab) reinforcement, diversions, and reseeding are usually evident. Never enough (resources, dear boy, resources), but it’s there. Not on the Limesweg; in fact, in the logging areas you can easily find yourself negotiating deep waterlogged ruts as the trees that used to have the waymarkers on are dragged off, customers’ names being painted on them (Egger, I noted several times!) as they are stacked. Oh, and mountain bikers like the footpaths too. Although there is an official Radweg, that is for happy smiling families who want a gentle ride that approximates to the line of the frontier. These adrenalin-fuelled action junkies want lots of rough, tough, downhill stuff and the first you know of their arrival is a ding of a bell, whereupon you hurl yourself out of their way (not easy on some narrow hillside paths). The evidence of their passing is everywhere; just look for their wheel ruts. Don’t even ask if the monuments are immune to such damage, you don’t want to know. Then there were the reconstructions. 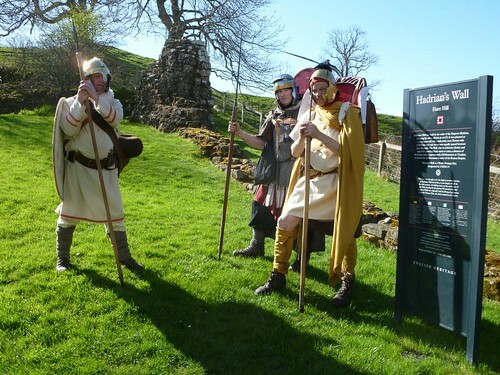 English Heritage are (perhaps understandably) squeamish about reconstructing installations on Hadrian’s Wall. There are no complete milecastles, only one turret (at Vindolanda, well away from the Wall), and a short length of curtain wall at Wallsend. The Germans have no such qualms. They have been at it since Wachtpost 2/1 was reconstructed at the behest of Kaiser Wilhelm I in 1874 and there has been a sprinkling of them throughout the intervening period and along the route of the path. Not all are now approved of, some now being considered ‘inaccurate’ (a fate which doubtless awaits the currently favoured form, but whisper that softly, in case the Germans hear you say it). In the light of such doubts, one wonders whether old stick-in-the-mud English Heritage have a point after all: today’s bold reconstruction is so easily tomorrow’s all-too-solid embarrassment. That being said, Limeskastell Pohl is a wonderful sight, even with its anachronistic wheelchair ramp (required by German law) winding up the rampart and the bridge across to the reconstructed tower. There were eccentricities, too, like the bizarre piece of pixellated pavement in the middle of nowhere that simply said ‘Limes’ as if somebody thought it would be a good idea. 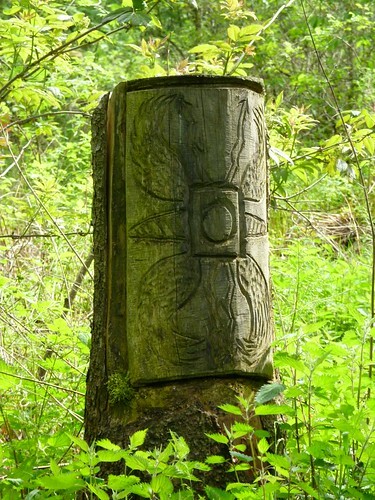 It might conceivably have been intended as art (I have my doubts), but if so was far less successful than the many examples of chainsaw sculpture I encountered, such as a legionary shield near Holzhausen (yes, we know there were not supposed to be legionaries on the ORL: don’t be so fussy!). If you are tempted to imitate me then your most vital piece of kit will be the two 1:25,000 maps that cover the two Länder (Rheinland-Pfalz and Hessen). I would go so far as to say that you cannot (indeed, should not) attempt it without them, so unreliable can the signage be. The Limes-Straße Verein put out oodles of free literature, much of it in English, and have a superb website, as do the Deutsche Limeskommission, for the archaeological side of things. 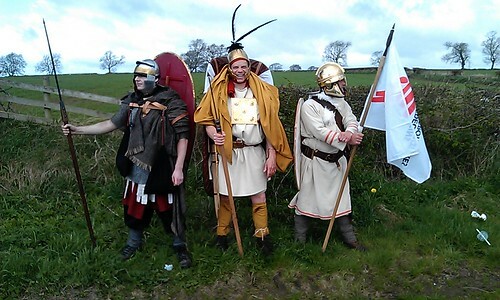 In these respects, they have the edge on the Hadrian’s Wall authorities, although not in all. I had an itinerary from the LSV which was almost always incorrect in its distances (another thing walkers obsess about, I’ve discovered). Did I mention the wild boar? Mainly evidenced by the anti-wild-boar electric fencing that I encountered, but once I saw that, I became convinced they were stalking me. Perhaps they were. At the end of it all, I am very glad I walked from Rheinbrohl to Saalburg, as it taught me a lot. Not necessarily the things I thought I was going to learn, but that’s part of the fun of adventures, isn’t it? It was a wonderful way to see Germany, although I did not meet many Germans doing it (in fact, I more than once wondered whether the zombie apocalypse had happened and nobody had bothered to tell me). I also confirmed for myself that some of the Apfelwein in Hessen can be every bit as good as real British cider (heresy! ), and, in the final analysis, it was worth all the sore feet and aching knees just for that piece of scientific research. I shall be back. Prosit, Frau Rauscher! 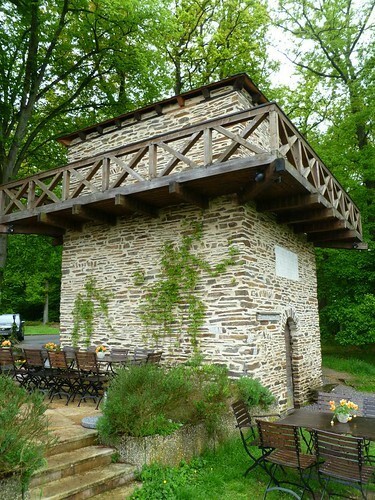 NB We stayed in the stylish-yet-cosy Ferienhaus am Limeskastell in the delightful little village of Pohl (which has an Ernst-Fabricius-Straße; as I keep reminding people, Fabricius is the only archaeologist to have part of Hadrian’s Wall named after them). Our host, Jürgen Schmidt (a Cicerone guide at the Limeskastell), lived next door and proved the very model of helpfulness during our stay. We owe him a great debt of gratitude.